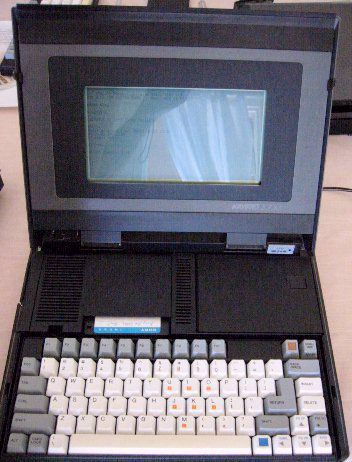 This is one of the first useable laptops, made by Kaypro Corporation, about 1985 or 1986. It is an 8088 IBM compatible machine, featuring up to 768kb of memory, and one 730kb 3.5" floppy disk drive. The CPU is a NEC chip, I forgot to write down the number when I had it apart, but it does not say V20, so I think it's a second source 8088. Kaypro used the V20 in their desktop IBM clones (Kaypro Professional Computer). 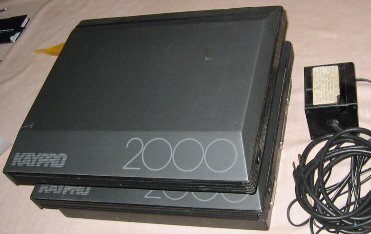 The display is reflective monochrome LCD, and was made in at least two different sizes.The overall size of the computer (closed) is 13.25" x 11.5" x 2.5", and it weighs about 13 pounds. The case is made of black anodized brushed aluminum, and has a very chic high tech mid 80s feel. It has a three cell lead acid battery back, using Gates batteries, which allegedly provides about four hours use from 24 hours charging. I have not replaced the dead batteries in either of my specimens. There is a 25 pin serial port on the left side of the computer (accessible by lifting a rubber flap), and phone connections on the bottom for the internal modem. There are some neat features on this laptop. The unit powers up when the lid is opened; there is a microswitch under the left rear corner of the top which does this. The floppy drive is very odd by modern standards; when the latch is released, the top half pops up about an inch, and a disk can be slid in, and the top pressed down again. There is a storage area for two floppy disks to the left of the drive. 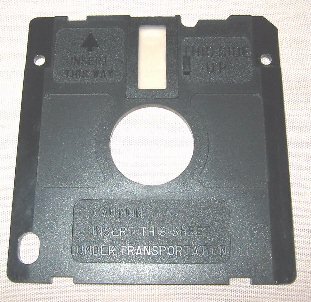 This drive protector is included to keep the heads of the drive from touching each other when the drive is closed without a diskette in it, for transport or storage. 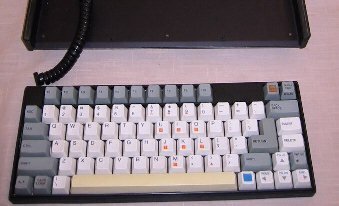 The keyboard lifts out, and is attached by a common telephone handset cord, just like the Kaypro II series of computers. This may be usefull with an external display, but the LCD is so hard to see that I have to be so close to it that there's really no way to use the computer with the keyboard out! I have two of these laptops, and each has a different size of LCD display. This is the "big" display, which is about 7.25" wide and 3.75" tall. The "small" display is about 9" wide and 2.75" tall. Both show 25 lines and 80 columns, but the pixel shape is different. It appears that the small display was first available, then the large display was introduced later, but I'm not sure. Neither display has good contrast, the big one has a dark background, and the small one has too light of foreground. It takes careful work to get the work area lighting set up to where it is possible to read the screen, and it's never very easy to read. This is the serial number tag on the bottom of the small display laptop. This is the serial number tag on the bottom of the large display laptop. I think the aluminum case and probably the LCD were made in Japan, but the rest of the computer was made in the US. Both have the same tag on the top, under the floppy disk storage area, which states that it is an American made computer...so perhaps the MADE IN JAPAN imprint on the bottom had to be covered up so people like me wouldn't get the wrong idea! 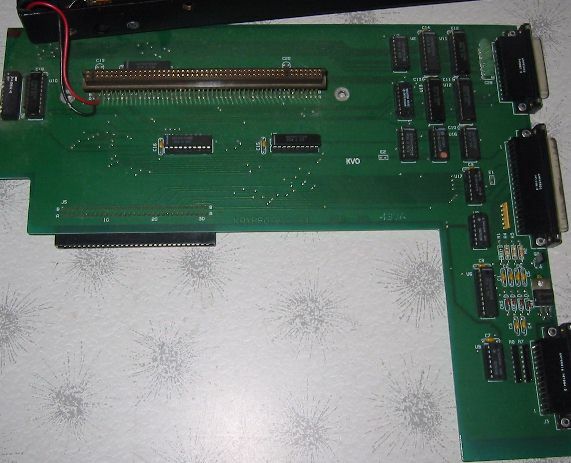 The system board, which sits in the computer upside down. You can see how to go about diassemblingthe computer. Note that the memory fits in three rows of eight sockets, so it does not have a parity bit. 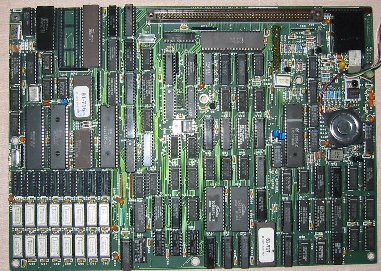 This is the board from the small display computer, and has only two rows filled, for 512kb total. 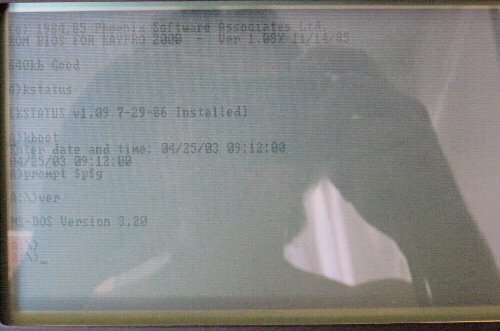 I have not taken out the other board to see what it has, but the boot display shows 640kb, so it may have the last row filled with 256k chips. This is a mystery which one day I may solve. Also notice that all of the chips are in sockets! this is a rarity on a laptop computer, especially nowadays when all the components are subminiaturized surface mount. I'm surprised that both of my laptops work, being over 25 years old and built like this. But apparently Kaypro was good at making reliable equipment, even if there were some serious usability issues such as the display and lack of a second disk drive. 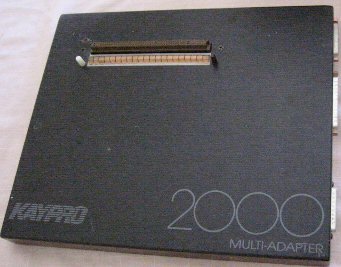 There is also a docking bay for the Kaypro 2000, although it's called a Multi-Adapter. It has several ports, and one ISA card slot, as well as a power connector. The laptop just sits right on it, there are two plastic pins near the ends of the docking connector which activate switches iside the computer to let it know that it's docked. I haven't been able to get too far with setting up this part, because I don't have the information on switch settings, and I haven't put enough time into it. I think the main use for the docking adapter is to have a video card connected to a real monitor, and perhaps an external disk drive for file copying operations. The circuit board inside has several ICs on it. Everyone needs a pile of junk like this laying around...two Kaypro 2000s,one multi adapter, and the original aluminum cased power supply. Since this web page was made in 2003, I sold most of this stuff. Seems that it was good prior art for a docking station patent suit!